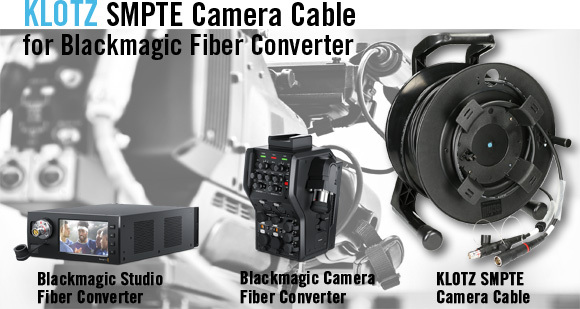 Since the ISE, we’ve received more and more enquiries about whether we can supply the right cables for Blackmagic Design's new Camera/Studio Fibre Converter. Of course we can! Our reliable, proven SMPTE CAM-PUU.. Camera Cable with LEMO connectors fits the bill perfectly. The TrussLink OCTO Signal Distributor is ideal for transmission of high data volume applications in the pro AVM sector. Our revolutionary SmartBeam OCTO 8x expanded beam connector is designed for transfer rates of up to 8 x 10 Gb/s. The new B2FM1N Balanced Patch Cable features balanced signal transmission for reliability and resilience, plus ultra-light design with composite XLR connectors. As a medium-sized manufacturer, we are subject to various statutory regulations such as the European Construction Products Regulation (CPR). We’re happy to report that selected cables from our catalogue have now passed the CPR certification phase and are officially certified as CPR compliant. We hope you enjoy reading this Newsletter! Our SMPTE CAM-PUU.. Camera Cable is the ideal solution, complying with the SMPTE-311M and SMPTE-304 standards for bulk cables and connectors respectively. The rugged PUR outer jacket conceals two E9/125 µm single-mode fibres for HD signals, suitable for maximum distances of up to 2000 m (depending on the equipment used)! The cable also has six copper cores, four for power supply and two for control signals. A central steel core provides enormous tensile strength – a valuable feature for mobile use. The LEMO connectors are also compatible with SONY, JVC, Panasonic and Grass Valley professional broadcast cameras. Incidentally, we are among the few companies with the sophisticated production technology for producing LEMO connectors, and are officially authorized and certified LEMO manufacturers! In our system overview you'll find the different possibilities of SMPTE cabling. Optical fibre cables are ever-present in today’s event technology. Audio, video, network or lighting, these multitalented FO cables are part of the setup in virtually all situations. Our Fiber Explorer optical fibre signal distribution cable, designed for stage use, inspired us to design the TSL-1S8OCLS. This cable is specifically tailored for use in stage trusses. Its ultra-rugged metal housing has four suspension loops for attaching with wire ropes, plus an M10 thread on the underside for affixing with e.g. a Manfrotto Super Clamp. We’ve made sure of great signal distribution too; our revolutionary, unique SmartBeam OCTO 8x expanded beam connector delivers transfer rates of up to 8 x 10 GB/s and distributes them to four Neutrik opticalCON adapters (LC/UPC). All connectors and sockets are naturally fitted with protective caps and have IP65 rating (protection against dust and water jets). The TSL-1S8OCLS’s omnidirectional connection technology easily copes with over 3000 mating cycles. For this XLR patch cable KLOTZ AIS combines durable, long-life connectors with its proven best-selling MY204 microphone cable, with extra-large conductor cross-section of 0.22 mm², low capacitance of 75 pF/m and ultra-dense braided shield. The cable's high flexibility makes the B2FM1N an ideal solution for all applications, especially when space and weight are crucial. From 10 June 2016, the EU Construction Products Regulation (CPR) has applied to all cables and wiring products for permanent installation in buildings. Cables are classified into European fire classes depending on their fire behaviour. Cables and wiring products with functional integrity are excepted from compliance with the CPR. Since 1 July 2017, CE marking has been mandatory for cables and wiring products subject to the CPR. In addition, manufacturers of products subject to the CPR – i.e. cables and wiring products for permanent installation – must now produce and publish a “declaration of performance”. Cables and wiring products placed on the market before 1 July (stock lots) may continue to be sold without this marking. Where cables and wiring products are concerned, the provisions of the CPR apply solely to fire behaviour. Other requirements addressing electrical and mechanical safety are unaffected and remain in force. At present EU countries do not specify the fire classes of cables to be used. In Germany, “normally flammable cables” are generally required, equivalent to class Eca or higher. The following list contains all KLOTZ AIS cables and wires that have passed the certification process. As a result of the certification, these products will be given a new article number as the fire class will become part of the article number. Please note that these CPR regulations apply only to bulk cable for permanent installation in buildings. They do not apply to premade cables or bulk cable for mobile use!